HIGHEST RATED UNIT IN THE INDUSTRY! The Foust 160R2 Air Purifier is the highest efficiency rated unit in the industry. The Foust 160R2 Room Air Purifier is especially designed for those with multiple chemical and environmental sensitivities as well as for anyone who simply wants clean air in their environment. The Foust 160R2 Room Air Purifier is so powerful, reliable, and quiet that it is used and recommended by allergists and environmental doctors nationwide. If you have severe reactions to contaminants, or even if you just want an additional level of protection to clean your environment, consider adding an optional Alpha-Stat pre-filter dust attachment to your Foust Air Purifier. With this option even more submicron particles or contaminants can be removed from any environment including all types of asbestos, all types of smoke, pollen, bacteria, dust, mold, spores, and animal hair – even chemicals and fumes like ozone, and formaldehyde. *NOTE: Prices include shipping within the continental U.S. only — when shipping outside of the continental US, email Next Wave at info@YourNextWave.com for shipping quotes/options. Please include the Foust Air Purifier model of interest and your COMPLETE mailing address and phone number. Tuesday – Thanks so much for the nice comment. Hope you visit the rest of our Blogs and website. There’s a lot of terrific information that you may also find useful! Peerless – Thanks so much for the nice comment and for your interest in the Foust 160R2 Air Purifier. Hope you visit the rest of our Blogs and website. There’s a lot of terrific information that you may also find useful! I liked this – very helpful. adobe – Thanks so much for the nice comment and for your interest in the Foust Air Filter 160R2. Hope you visit the rest of our Blogs and website. There’s a lot of terrific information that you may also find useful! My daughter started having allergic reactions to our cats. What is the best low to mid priced air purifier to use for dust mites, mold, smells? Mold Blogger – Thanks for visiting our site and for your interest in the Foust 160R2 Air Filter. Sorry to hear that your daughter is having allergic reactions. Granted I’m biased, but all my research pointed to the Foust Air Filters as the best on the market for a myriad of reasons. They’re tops in engineering with all metal construction, use no adhesives, contain large beds of carbon, and have HEPA filters without any glue. They are specifically manufactured for people with multiple chemical sensitivities,(MCS), severe allergies, or asthma, to remove chemicals, fumes, odors, and particles down to 0.1 microns in size from the air. They have performed well in independent lab tests and are used and recommended by allergists & environmental doctors nationwide. Since 1974. Foust Air Purifiers have been the units of choice of doctors and allergy sufferers. They’re GREAT for use in the home, office, schools, or any place you need clean air. The best are your HEPA air filters. Perhaps you want to have those installed. Eh? The Foust 160R2 Purifier uses a state of the art HEPA filter that removes particles from the air with an efficiency of 99.738% at 0.1 Micron. This is a unique HEPA filter. 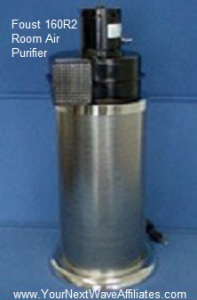 Foust filters | Mikidogs – thanks for your post and for your interest in the Foust 160R2 Purifier. Hope you visit the rest of our Blogs and website. There’s a lot of terrific information that you may also find useful! You can also subscribe to our site by selecting RSS FEED in the toolbar at the VERY bottom of the page or by clicking on this link! Alpine – Thanks for the post and for your interest in the Foust Air Filter 160R2. Hope you visit the rest of our Blogs and website. There’s a lot of terrific information that you may also find useful! You can also subscribe to our site by selecting RSS FEED in the toolbar at the VERY bottom of the page or by clicking on this link! These work on smoke odors right? How to Buy? How do I pick out the right Air Purifier? Richard – Thanks for your post and for your interest in the Foust 160 R2 Air Purifier. Yes they do work on smoke odors amongst much more! You can purchase the Foust air purifier on our website by selecting the PayPal button. Simply choose a unit to fit the volume of space you intend to clean. The Foust 160 R2 is recommended for approximately 1100 sq ft. The Foust 160 DT is recommended for approximately 500-700 sq ft.
Good write-up. We feel youll enjoy, just click the links on this site – good info. I believe this is exceedingly good info! I’ve tweeted this. Several thanks for sharing! Great facts usually discovered on this internet web site. After reading your post called Foust 160R2 Air Purifier, we did more research and agree that this is the Cadillac in the industry. Your information was certainly worth going over. We’ll place an order in a few days. We are having so many allergy issues and so we checked out your post called Foust 160R2 Air Purifier. We really found the information worth visiting and will buy one of these for our bedroom. Thanks for all the great info. We were looking to buy a good air purifier. After reading the posts on your site, we’re convinced to buy this Foust 160R2 Air Purifier. It sounds perfect for u. In fact we ordered a few minutes ago. Looking forward to receiving it soon. We like your site and all the good information. We think it’s best to visit often.